Many years ago, back when I still lived under the wide expanse of my parents' roof, I bought myself a treadmill. "I will walk everyday and get fit!" was my declaration. "That thing has to go in the lounge room?" was my mother's. The Pacer 3501 was a large beast. Not as huge as those gym treadmills, but still, not something easily shifted. I set it up in front of the TV downstairs, and for a time, it worked reasonably well. I'd put on a couple of episodes of Blackadder, then plod away for 30 to 45 minutes. I did this a few times a week. When I moved into Chez Clumsy, the treadmill came too. It was a poor choice from the start. My apartment is thankfully quite spacious, but really not enough for a treadmill. I should have sold it off straightaway, but instead I made my Dad, my brother and Greg hump the damn thing up the stairs and set it up on my (quite teeny) balcony. Over the past four and a bit years, I have used it, well let's see now, carry the one - maybe five times. For the past two years it has sat, folded up, in the corner of the balcony. It became Item Number One on my List of Things I Really Want to Get Done But By Heavens There Just Isn't Enough Time and It's Really Heavy and I'll Need a Ute or Something to Get Rid of It and Jeez I Just Can't Be Bothered Today. In short, the only good workout the treadmill has given me in recent times is an exercise in procrastination. But all that changed yesterday, and as these things do, it happened in the relative blink of an eye. On Friday night I put out a tweet that basically suggested I wanted to make the treadmill disappear. My friend Mickey Fitz, who is currently starring in So You Die A Little at the Brisbane Arts Theatre, which you really should see, popped his hand up, saying he was looking for one. Then, a chap by the username of @unixbigot tweeted me, saying he often grabs treadmills and strips them for the motor, and he was driving into town with a trailer on Saturday and could grab it. But if someone else wanted it to run on, he was still happy to offer his trailer for transport. I told both of them that I should just check if the damn treadmill was actually busted after years of inactivity. So braving the cobwebs and dust, I lowered the board, plugged it in, and hey presto - it worked. I offered it to Mickey Fitz, and @unixbigot still said he was cool to pop round Saturday afternoon to help. Now, when Mickey Fitz arrived at my place on Saturday, we got to talking. We discovered that I assumed @unxibigot was a friend of his; he assumed @unixbigot was a friend of mine. In fact - he was just a RANDOM GUY. But WHAT a random guy. 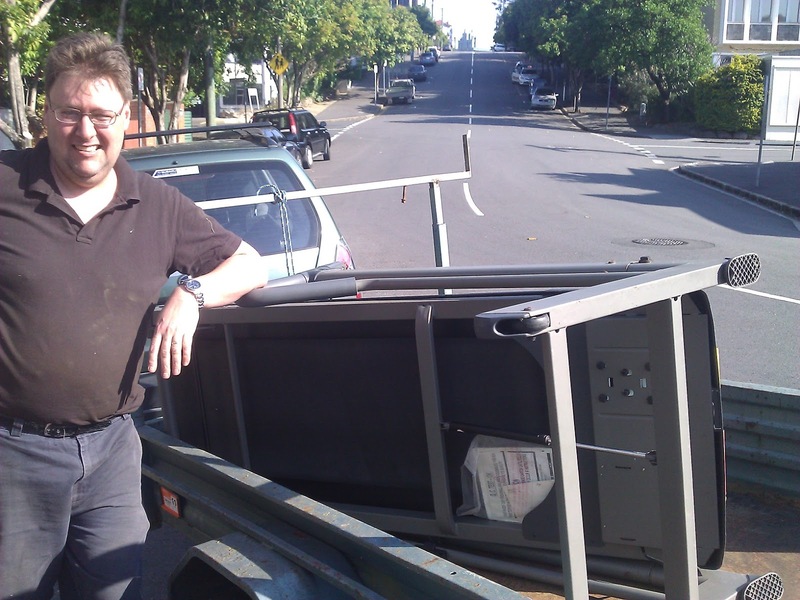 @unixbigot - real name Chris - turned up as promised with his 4WD and trailer. He'd done a run to the tip, so was on his way back home. But still, he came in with his sweet young son, helped manhandle the damn treadmill down the stairs and out front, pop it into his trailer, then follow Mickey Fitz back to his place at Paddington. 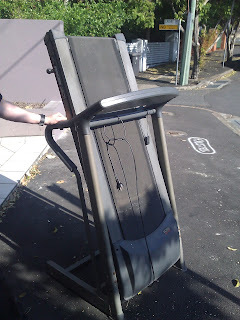 Within 24 hours of complaining about the treadmill on Twitter, the problem had been sorted, and I'd met a genuinely kind man who did a favour for two complete strangers without expecting anything in return. I quizzed Chris about his generosity, and it turns out he's a big supporter of the FreeCycle movement, which has its roots in that old adage "One man's trash is another man's treasure". FreeCycling connects people with stuff they don't want with people who want that same stuff, all via the magic of the internet. There's even a local Brisbane chapter, if you're interested. I'd vaguely heard of FreeCycling before, but thanks to Chris, I'm going to keep it front and centre when next I seek to get rid of things. I'm also going to be sending Chris a double pass to my next show, How To Be A Man. I do hope he doesn't mind a *teensy* bit of profanity and blasphemy. Otherwise I'll have to think of something else! "a *teensy* bit of profanity and blasphemy"...obviously it can't be based on the John Birmingham & Dirk Flinthart book of the same name.